Basements that were originally for storage and safety during storms are now being turned into home gyms, entertainment areas, home theaters, play rooms and additional apartments for more individuals to live. 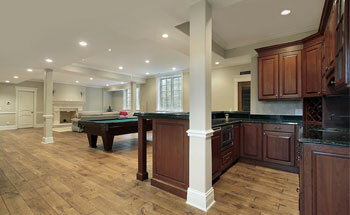 Wyeth Woodworking and Remodeling can transform your unfinished basement with more than just carpeting and drywall. There are many options for your extra floor. Take liberties and be creative with Wyeth Woodworking and Remodeling. Wyeth will work with you beginning with what you can expect during the process, to what material will provide the best insulation for your original foundation a room style choice. Wyeth will be able to provide seasoned, insured and licensed basement contractors who specialize in flooring, lighting, windows, dehumidifiers, ducting, wiring and electricity and basement insulation. At times, the most obvious solution is not always the best. Every home has a unique foundation. Depending on weather erosion, location of your house on an elevated plane or by the water, a basement-finishing project is different for every house. Taking the special design needs of a finished basement into consideration when designing a basement renovation plan is an absolutely vital step. Otherwise, it's likely that the homeowner will be faced with several immediate and long-term disadvantages and expensive finished basement problems. Wyeth Woodworking and Remodeling doesn’t take the easy way out for your basement renovation project. Talk with us about the best uses for your basement space.